Brynne Frederick eyes the return during a second doubles match for Washington at Miami Trace High School Monday, Sept. 10, 2018. Hannah Clemons makes the play for Miami Trace during a second doubles match against Washington at Miami Trace High School Monday, Sept. 10, 2018. Megan Downing of Washington volleys against Anita Pursell of Miami Trace during a Frontier Athletic Conference match at MTHS Monday, Sept. 10, 2018. Miami Trace’s Natasha Andreas stretches for the return during a second doubles match against Washington High School played at Miami Trace High School Monday, Sept. 10, 2018. 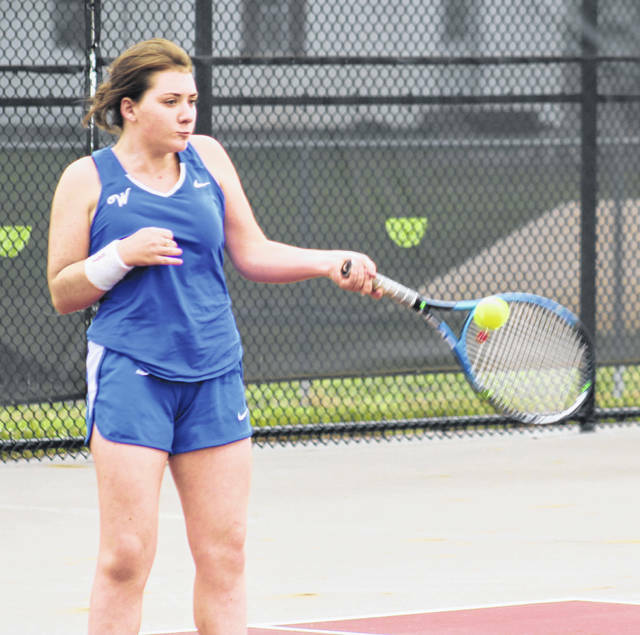 Anita Pursell keeps her eyes on the ball for Miami Trace during a first singles match against Washington’s Megan Downing at Miami Trace High School Monday, Sept. 10, 2018. Washington’s Payton Maddux hits a return shot during a second doubles match at Miami Trace High School Monday, Sept. 10, 2018. 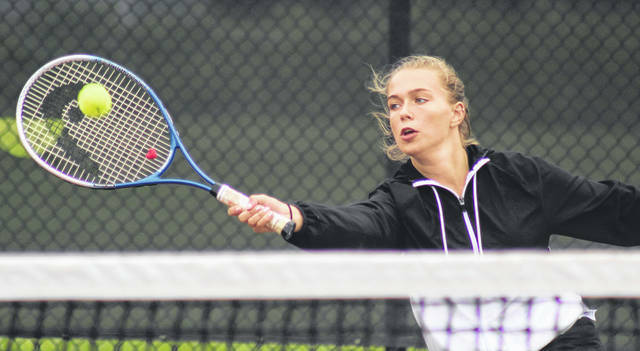 On a cool, overcast Monday, Sept. 10, the Miami Trace Lady Panthers tennis team welcomed the team from Washington High School for a Frontier Athletic Conference match. 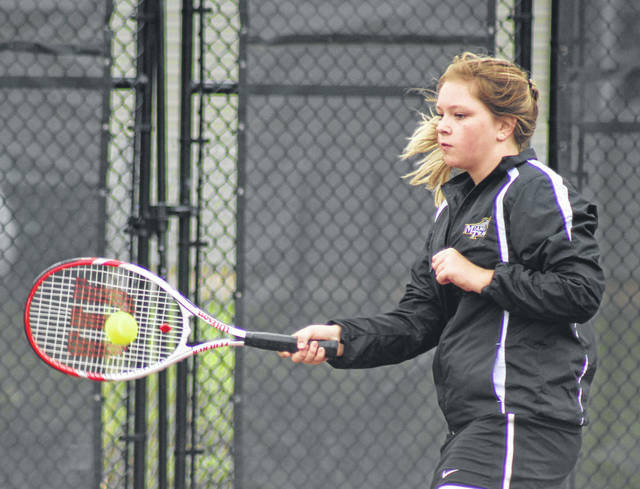 Washington remained undefeated in the FAC with a 5-0 victory. 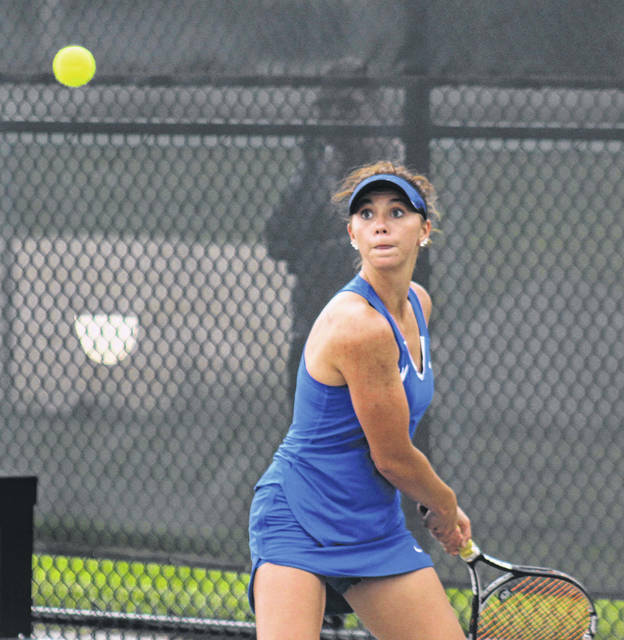 At first singles, Megan Downing defeated Anita Pursell, 6-2, 6-1. At second singles, Jen Richards beat Bayley Thompson, 7-5, 6-1. Third singles had Brooklyn Foose topping Cameron Bucher, 6-3, 6-3. At first doubles, Beth Wilt and Sydnie Hall beat Kyleigh Slone and Beth Hogsett, 6-2, 6-0. Brynne Frederick and Payton Maddux defeated Hannah Clemons and Natasha Andreas, 6-2, 6-0. In one j-v match, Washington’s Mei Kobayashi beat Kendall Elliott, 8-4. 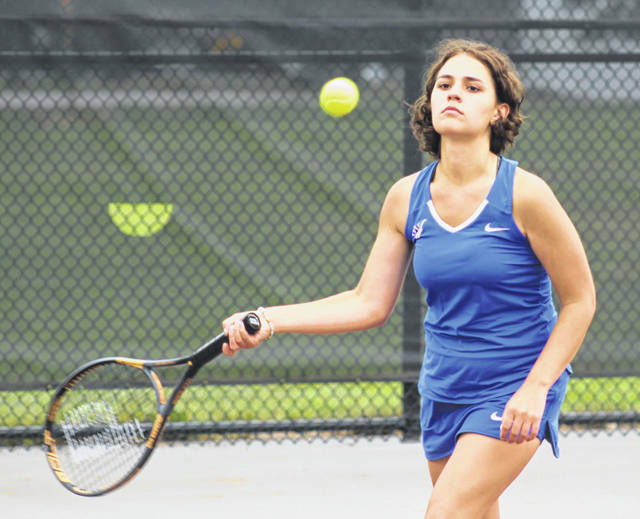 Washington tennis was scheduled to play at Jackson Tuesday and at Clinton-Massie Tursday, Sept. 18. Miami Trace was slated to host Hillsboro Tuesday and then have a home match against East Clinton Wednesday. 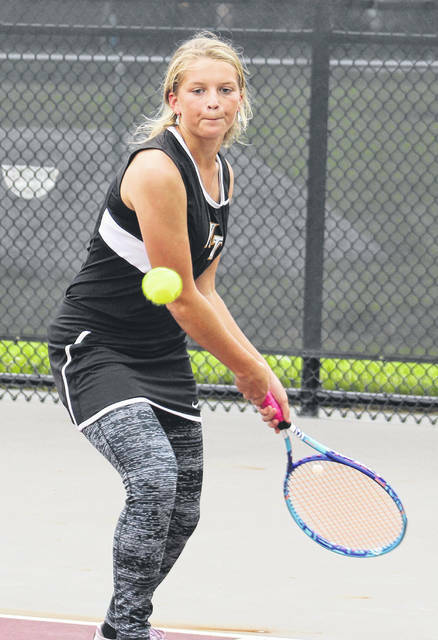 https://www.recordherald.com/wp-content/uploads/sites/27/2018/09/web1_Brynne-Frederick-WCH-10us-9-10-2018.jpgBrynne Frederick eyes the return during a second doubles match for Washington at Miami Trace High School Monday, Sept. 10, 2018.
https://www.recordherald.com/wp-content/uploads/sites/27/2018/09/web1_Hannah-Clemons-MT-10us-9-10-2018.jpgHannah Clemons makes the play for Miami Trace during a second doubles match against Washington at Miami Trace High School Monday, Sept. 10, 2018.
https://www.recordherald.com/wp-content/uploads/sites/27/2018/09/web1_Megan-Downing-WCH-10us-9-10-2018.jpgMegan Downing of Washington volleys against Anita Pursell of Miami Trace during a Frontier Athletic Conference match at MTHS Monday, Sept. 10, 2018.